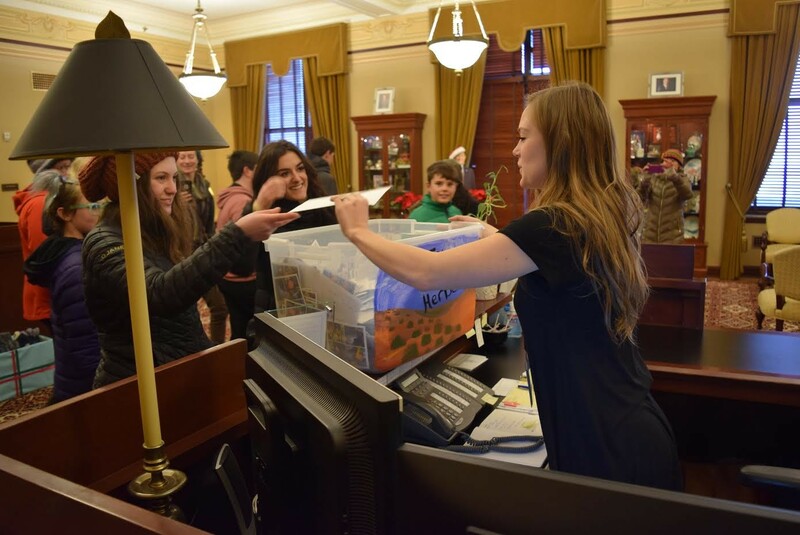 Young womxn students and educators deliver nearly 4,000 letters to the governor’s office urging him to protect public lands. Gov. Gary Herbert’s office received a special delivery Thursday: nearly 4,000 letters asking him to support and protect Utah’s wild public lands. But it wasn’t any normal delivery: It had a noticeably feminine presence. Josee Stetich carries a box of nearly 4,000 letters in support of public lands addressed to Gov. Gary Herbert up the Capitol steps. Stetich, a senior at Westminster College and an intern with the Southern Utah Wilderness Alliance, said she organized the letter-writing campaign because she was “wildly disappointed” with the Emery County Public Land Management Act backed by Sen. Orrin Hatch and Rep. John Curtis, both Utah Republicans. The bill, introduced in May, designates nearly 578,000 acres of wilderness, establishes the 336,000—plus-acre San Rafael Swell Western Heritage and Historic Mining National Conservation Area and expands Goblin Valley State Park. However, environmental groups such as SUWA say the measure is anemic and excludes nearly a million acres of land that should be designated as wilderness. That’s where Stetich and more than 35 other educators and “young womxn” students came in. Stetich emphasized the term “womxn” Thursday because she wanted to be inclusive—”womxn” is a term used to include people of gender orientations who identify as women or femmes—and give them a voice as well. Students drop off the letter bounty in support of public lands to Gov. Gary Herbert's office. “I feel that without the protection we will lose an incredible outdoor classroom, one that is complete with fully differentiated lesson plans for exploration, self-discovery and reflection,” Lammert said. 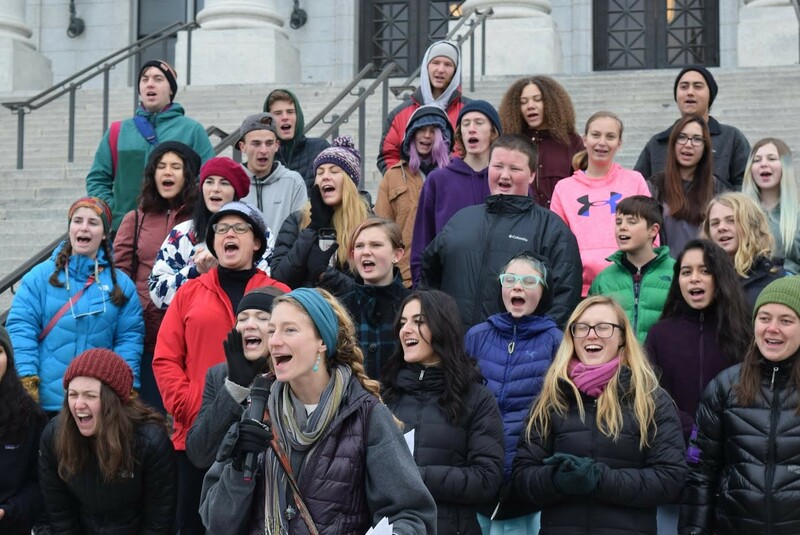 Other students from Rowland Hall-St. Mark’s and West High School also shared stories of their love for Utah’s lands. Ella Baker Smith, a student at Rowland Hall, recited a letter she wrote to Mother Earth. 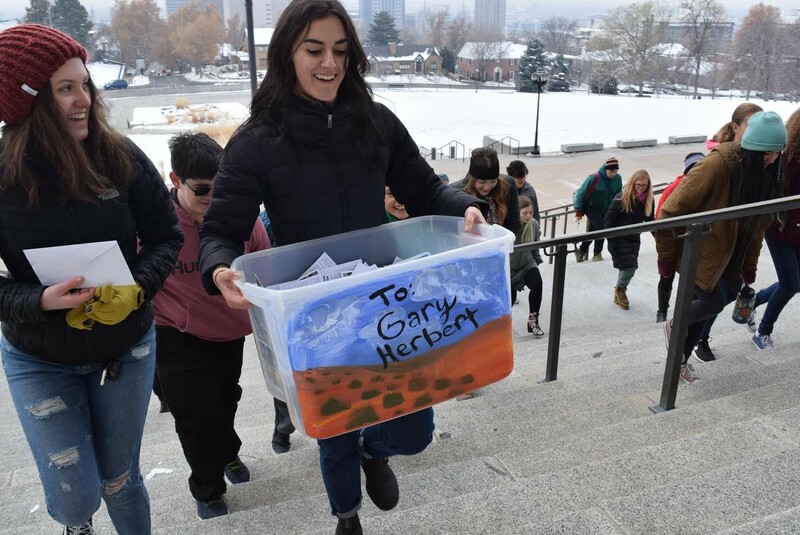 Following their speeches, students walked into the governor’s office with a tub full of letters featuring a wilderness painting on the outside and the words “To: Gary Herbert” painted across the sky. Hopefully, Stetich said, adding their voice to the conversation will help their conservation efforts.